PRINCE OF FENCES ready to go! 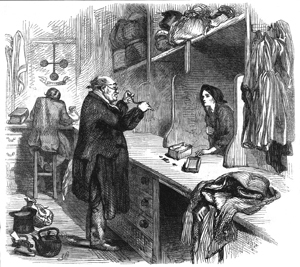 Like the PRINCE OF FENCES, this pawnbroker in Victorian England inspects goods for sale. From January -April 2011, Lauryn Axelrod and Eric Stern, the creators of PRINCE OF FENCES, worked intensively on a new draft and completing the musical score. PRINCE OF FENCES is now ready for concert readings, development and workshop productions. To receive a script and/or CD, please contact Morgan Jenness or Leah Hamos at Abrams Artists Agency.